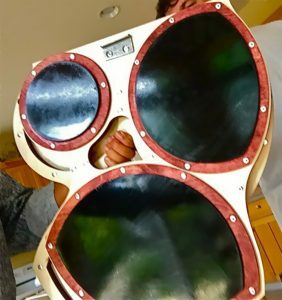 The Mothership™ Tenor pad is one of the most portable of its kind. Weighing in around 14 lbs, with a folded dimension of under 2 foot square, you won’t be overloaded when getting from point A to point B! When fully open, the locally manufactured heavy-duty steel center clamp holds the whole unit solid as a rock. The newly improved 6 DarkMatter™ playing zones are chambered to produce variant tonal response. The increased thickness of the Birch plates has increased stick response on the Darkmatter™ and raised the pitch across tonal zones. 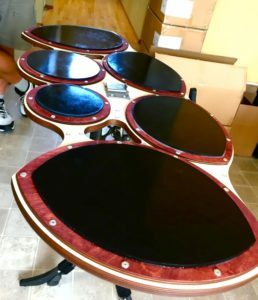 Constructed of white Birch hardwood ply with Burgundy stained playing zones, aluminum rivets, steel hinges and rubber feet, this Mothership™ looks as great as it plays. Available for purchase as an accessory is a Mothership™ Replacement Clamp, just in case yours ever goes missing. There is a 3 part metal clamp that holds the Mothership™ in an open position flat – this is the loose center piece to lock the other two in place.